It’s a cool, misty morning in Frosty Hollow. The coffee is brewing. The oven in Gail’s kitchen is emitting wonderful aromas. Outside, the sun streams over the top of the hill and touches “a little piece of heaven in God’s Country,” beautiful Potter County in north-central Pennsylvania. Put yourself in this scene, strolling by the stream, relaxing on the porch at the farmhouse watching the fish jump in the pond. Whether you’re in Potter County to Star-gaze at Cherry Springs State Park, fish the many trout streams, 4-wheel, snowmobile, hike, bike or play golf, you’ll find yourself in the center of the unspoiled, untouched and untamed terrain of God’s Country. Cruise Route 6 on a motorcycle, hike the Susquehannock Trail, bicycle through the Pennsylvania Grand Canyon or take a relaxing drive and enjoy the scenery and wildlife. Once you experience the country comfort, you’ll find yourself longing to return to experience every season. 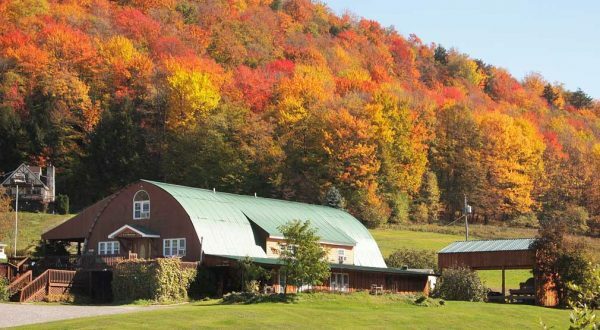 From the beauty of spring to the cool, starry evenings of summer, sweeping into the glory of autumn or riding your snowmobile over hundreds of miles of trails during winter, you’ll find yourself putting Frosty Hollow Bed and Breakfast at the top of your list of country getaways.